In a perfect world, the way I — or any other cantor — would learn the ropes of a hierarchical visit would be to spend ten to fifteen years singing at the analogion with a protopsaltis who knew what he was doing. Excepting that, I would take a priest who understood the rubrics with a thorough knowledge of detail and could explain clearly what was supposed to happen from the cantor’s perspective. Excepting that, liturgical books that were written to address matters from a cantor’s point of view rather than a cleric’s would be acceptable. None of those possibilities in fact being the case, what I’ve had to do for the last five years is pretty much wing it. For my first episcopal visit, Fr. Athanasius handed me a photocopy of the Liturgikon’s rubrics for the Divine Liturgy and said, “These are wrong, but you’ll get the basic idea.” He gave me notes on what was really supposed to happen, which I followed, and in turn, that wound up being not quite what we did either. Some variation on that has occurred every time since then; each visit has gotten a little better, and each visit has yielded a priest or somebody coming up to me afterward and saying, “Oh yeah, what I forgot to tell you earlier was this…” It wasn’t until after the third visit, I think, that anybody bothered to tell me that the bishop is supposed to vest during Lauds and that there are some changes made to accommodate that action. But, again, each time has gotten a little better, and for His Grace’s visit a couple of weekends ago for the Feast of All Saints we got it mostly right. The one thing I know I missed was the “Many years, master” that replaces “We have seen the true light…”, but I had Papa Ephraim’s long “O Lord, guard our master and chief priest” prepared for the Kairon, and the solution for the Trisagion problem was to swap out the setting from Cappella Romana’s The Divine Liturgy in English, adapted for hierarchical use. It was not the familiar version, so the autopilot problem was avoided. (Bp. MARK had mentioned to us before that the Greek model, as heard on the Angelopoulos Divine Liturgy recording, was in fact the usual Trisagion for hierarchical visits.) I got one person afterward who asked, “Since when is God ‘strong’ and not ‘mighty’?”, but beyond that, things were pretty smooth. 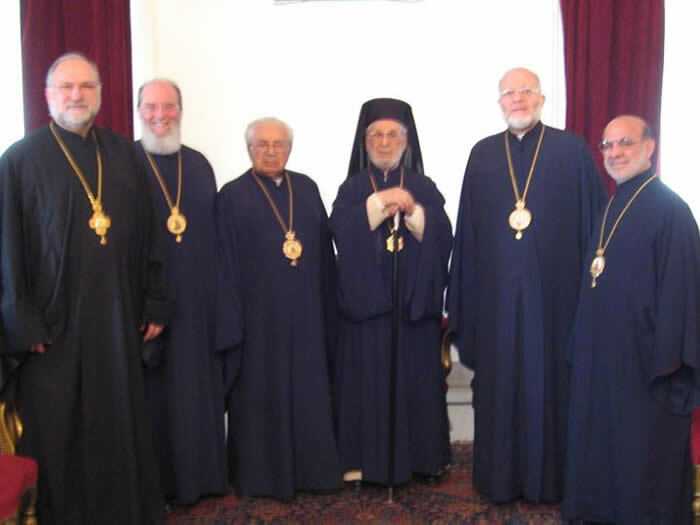 I’ve observed before that, when I participate in a hierarchical Divine Liturgy, the structure of the service and the way the parts function suggest to me that the presence of a celebrating bishop is actually assumed to be the norm, and that only having a priest as the celebrant is the accommodation. A way this was made manifest this time around was at the Cherubic Hymn. To back up for a second — in February, Fr. Peter had me sing the long Cherubic Hymn from The Divine Liturgy in English for the Divine Liturgy of the Presentation of Christ in the Temple. He had liked how it had worked liturgically during John’s visit; we only needed to sing it once (instead of the threefold repetition we have to do with our usual setting), it was unhurried, and then he actually had enough time after the Great Entrance to do what he needed to do. “Sing it again,” he said, “I want to see if it really worked as well as I remember.” Well, afterward, he said, “No, that won’t work. It’s too long. I was waiting behind the iconostasis for three minutes for you to finish the first part.” So there went that idea. Well, what was clear that weekend, as we repeated the Cherubic Hymn a third time, and then had to repeat “Let us now lay aside all earthly cares” on its own, a second time, then a third time, and still a fourth time before the procession came out from behind the iconostasis, was that the reason the other setting was “too long” is because it assumes the presence of a bishop. What was also clear was the assumption that the Cherubic Hymn will cover the Great Entrance a good chunk of the way around the church, since the priest only has one petition before he reaches the bishop at the solea. “Perhaps it’s better to make the long way the usual way so that you aren’t having to rejigger everything when the bishop comes,” I observed to Fr. Peter afterward. “You might be right,” he said. I think I will probably have the choir review the long Cherubic Hymn for next time. In any event, it was good to have Bp. MARK with us; I haven’t seen him since January of ’09, a month before the confusion (as it is convenient to refer to it) started. Εἰς πολλὰ ἔτη, Δέσποτα!